WD Separators l Vortox Air Technology, Inc.
WD Separators have the ability to separate water from fuel, oil from air, and water from oil – depending on model. The Separator collects the unwanted contaminate, leaving only the desired liquid or vapor to be released. 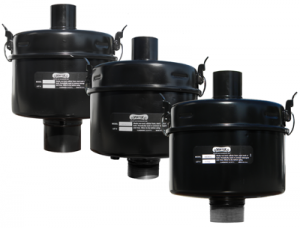 The WD series are commonly used to vent crankcase blow-by on engines. Each Separator is built with Electro Galvanized coated cold rolled Carbon Steel and finished in a black baked polyester coat. Customization in size and design is available upon request. Vortox Air Technology filter media, made of finely coiled interlocking Stainless Steel wire, lines each Separator and collects the unwanted contaminate.